Learning to play the piano properly has never been something that most of us can just walk into cold, but there are techniques that can be used in order to try and make the learning process as easy as possible. Georgia Tech, for example, created some gloves which vibrate in order to help people learn how to play. Ingenious stuff. But what about touch typing? 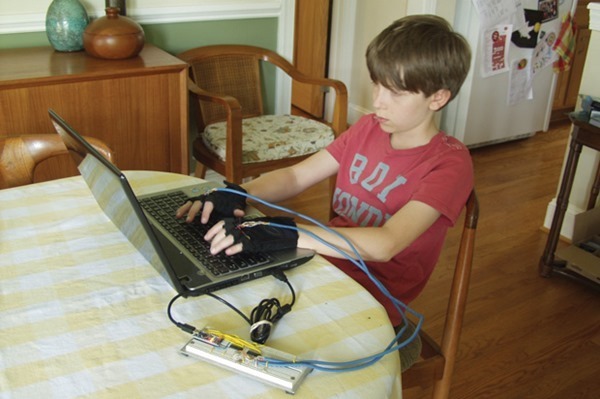 Equally as difficult for some to pick up, touch typing was something that IEEE Spectrum senior editor David Schneider wanted his 11 year old son to learn, and he knew just how to do it. While the noggins at Georgia Tech used all kinds of wonderful bits and bobs to create their hardware, Schneider instead had to settle for vibration motors from eBay and a load of wires connecting his gloves to an Arduino, but it works and that’s the main thing. So how does it work? Well, Schneider created an app that displays a word on the screen one letter at a time, with the vibration motors in the gloves then indicating where the key is. It’s obviously then left up to Schneider junior or whoever wears the gloves to actually do the typing though, and that’s where the learning comes into play. Speaking of play, while it’s a shame that this implementation didn’t go as far as tying the whole thing into some sort of mini game, there’s absolutely no doubting that this is about as cool as homebrew gets. If you’re wanting to learn how to touch type, we’re sure this is one of the better ways of doing it. Games have existed in the past that have tried to teach kids how to type, with limited success. We found that spending 20 years of living in IRC rooms was the best way to learn for us, anyway! We’re certain such technology won’t remain a homebrew affair for long, since it has the potential of teaching people on how to do stuff, and in this case, learning how to touch type. The idea is without a doubt the coolest we’ve seen, but only time will tell when and how the big guns will adopt the idea and bring it to the mainstream.